Produced and arranged by Jason Miles. Sly Stone got it right. In 1968, the Family Stone was a band with no boundaries. The music conveyed the message of the times. Whether it was “Dance to The Music” or “You Can Make It if You Try”, the message was there  in the music. Go beyond the message and these were some seriously funky cats! In May 1968, I sat in the 2nd row of the mezzanine at the Fillmore East in New York, waiting to see Jimi Hendrix. Sly and the Family Stone were the opening act. Sly and the band came out  everybody dressed in white - and started to hit it hard from note one. They immediately won over 2500 new fans. I followed them for the next 5 years, bought their albums and played in several cover bands playing their music. And I have been listening to that music now for the past 40+ years. Making an album of Sly's music had been on my mind for over a decade. I saw the opportunity to reintroduce this great music and re-imagine Sly's music for 21st century sensibilities. That it had stood the test of time was obvious. And I had the band to do it. When Global Noize was conceived in 2008, I was aware we live in a world constantly connected to one another. Yet we remain unsettled. I hope the musical force behind GN might bridge this cultural dissonance. Sly’s vision was and is timeless, as it addressed these same cultural elements. It’s for "everyday people" after all…. Things change and we offer thanks to the great artists and mentors preceding us. 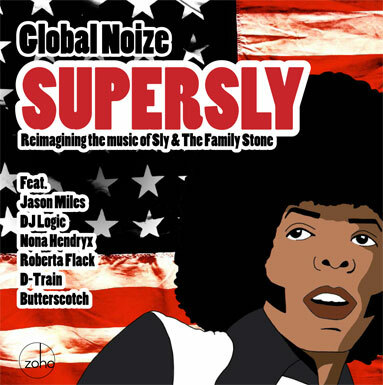 Global Noize was ready to take on Sly's music, and we started our tmusical journey in our ever changing laboratory of great players and voices. Picking the material was not a real challenge, but once Roberta Flack agreed to sing “It's A Family Affair”, the rest all fell together without effort. Time stayed steady on the mind of Sly Stone, the “Spaced Cowboy in Command”, one of the brightest lights of the late 60s/early 70s possessed in song. The questions were and remain “where are we going,” “how can we best facilitate the ride” and “where would we like to wind up” standing … together … in gratitude for the ability to be ourselves…in perpetuity! The world is so much smaller now, yet insidiously and pitifully divided in spite of every technological and communications advance we have made on the planet. From the senseless slaying of Trayvon Martin down south in the darkest backwards depths of Florida to the relentlessly raging war in Afghanistan, evil’s song remains the same. But as members of The Universal Family Stone, we wield shape-shifting songs of unity, peace and tolerance … songs blasted with an ancient future ring of Promised Land freedom that is vehemently keeping the torch alight and a dream alive. 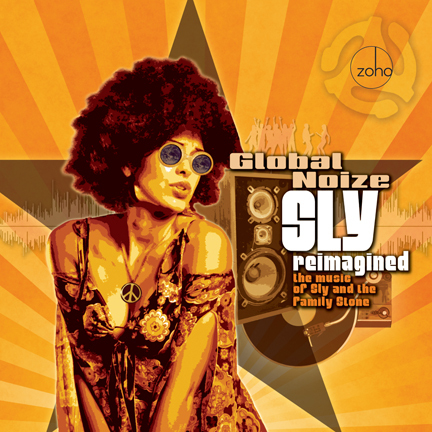 CD cover of Global Noize's European release with Membran, Germany. The music of Sly Stone is bumpin’-n-barkin’-n-breathin’ … and in very good hands within the album at hand. Jason Miles and his pan-cultural crew of aural shamans simply celestially encapsulated the vibe and whisked it on a Global Carnival Ride - bowing to its essence…but for another space and Time. Produced and arranged by Jason Miles. Associate producers: DJ Logic, Tim Ryan. Recorded at The Clubhouse, Orange County, NY, Fantasy Studios, Berkeley, CA, Shelter Island Sound, NYC, Kraked Studios, Paris, France, and many home studios across the globe! Engineered by Jason Miles, Steve Addabbo, Phil Badell, Jesse Nichols, Ted Pecchio, Loik Kraked, Brian Dunne, Dean Brown. Tracks 1 - 9 mixed by Jason Miles and Jimmy Bralower at The Club House , Orange County, NY, and at Dynotone Studio, Roslyn, NY. Track 10 mixed by Goh Hotoda at Goh and Nokko Studios, Tokyo, Japan. Mastered by Mike Fossenkemper at Turtletone Studios, NYC. Package Design by: Jack Frisch. Executive producer: Joachim "Jochen" Becker.